A women cricket academy would be established in Odisha’s Balangir, Odisha Cricket Association (OCA) Secretary Asirbad Behera said on Monday. 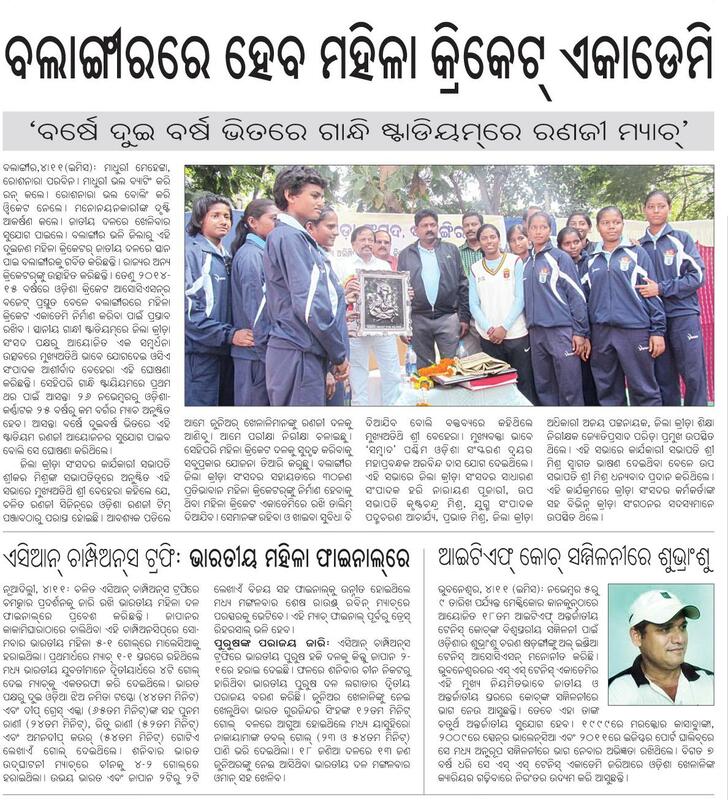 OCA would provide various facilities for the running of the academy, where women cricketers under 19 years would be given coaching, said Behera who was felicitated by the Balangir District Athletic Association. 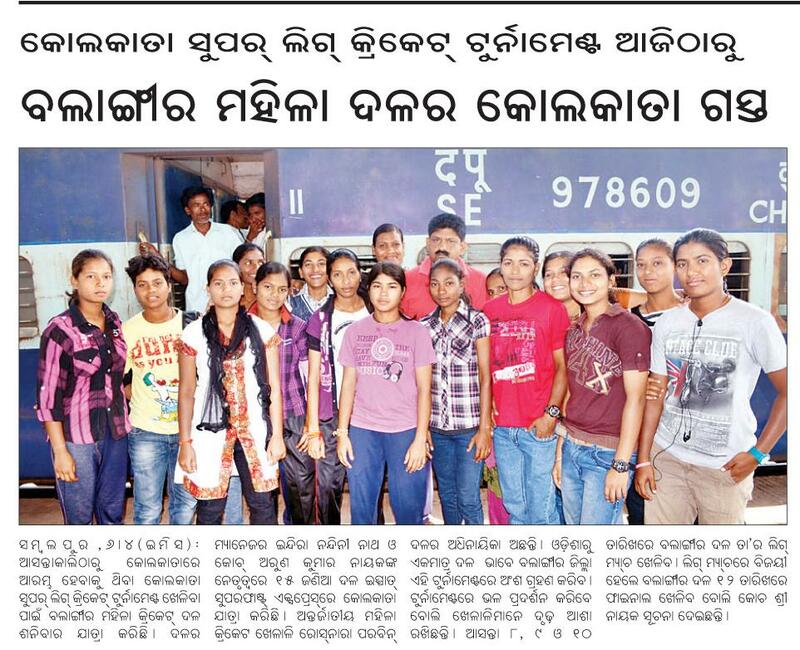 Madhu Mehetta and Roshnara Parwin, two women playing for India, are from Balangir. Expressing satisfaction at the proposed academy, cricket coach Arun Naik said it would help in tapping hidden talents. New Delhi: It is a blazing hot afternoon, a group of 4-5 boys are sitting under the shade of a mango tree with hockey sticks in their hands. The kids are from a village a few kilometres off Sundergarh town, a place where no one speaks or talks about cricket, it is hockey all the way. Ask anyone about their favourites sportsperson and it is hockey player, most prefer and idolise Dileep Tirkey, cricket does not even feature in the list. Most of the local tournaments held here are not fancy affairs, at times the prize is a goat. Sundergarh belongs to impoverished region of the Chotha Nagpur Plateau, a place which has great mineral wealth, yet has seen little or no development. The region is famous for producing world class hockey players and being good is at the time the only hope for a secured future. It is not a cakewalk for most of them, the dream involves endlessly hours of honing their skills with makeshift bamboo sticks, poles serve as goalposts. Drenched in sweat and a bruised leg to show off, 10-year-old Amit Tirkey, dribbles with a piece of stick bent at one end. He is too poor to afford a proper hockey stick. Mention the name of any of the famous hockey players from this region and his eyes light up. He adds, “I share the same surname as Dileep Tirkey and I want to be a great player like him, but I want to be a midfielder or a forward and not a defender.” When asked why, he adds, “I like to score goals and not stop goals”. Pat comes a tap on his head from his friend, who dares him to score a goal and off they go to play on the dusty and stony surface, the joy clearly evident for all to see. The question that everyone wants to know is how and why did the game become so famous in this part of the country? Some believe that the Christian missionaries were the main reason for spreading the game. 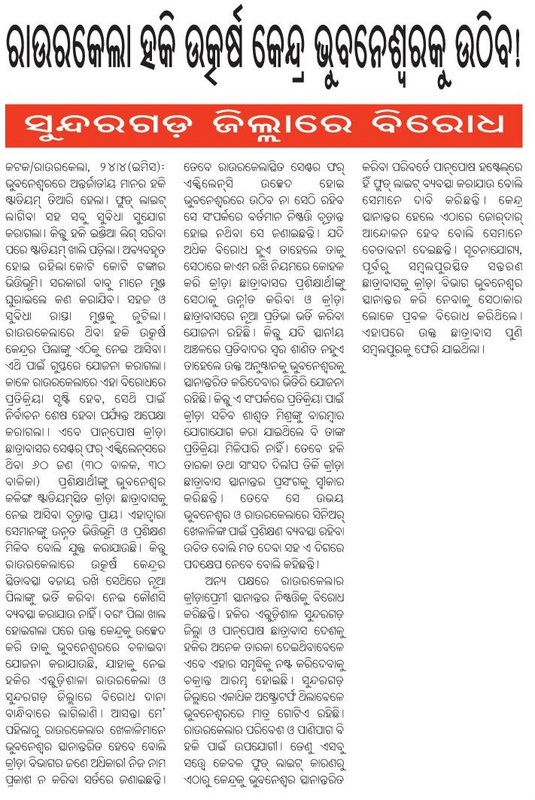 Sampad Mahapatra, a journalist who has covered the region for decades, points out that most of the players who have played for the country belong to the Oram tribe. Most of the Orams are Christians. Mr Mahapatra adds, along with hockey a host of other games were also introduced, but it is hockey which became a rage. What also works in their favour is their never ending stamina and strong legs. For those who graduate to the next level, there is a SAI academy in Panposh, near Rourkela. The academy which is meant to provide a platform to raw talent, does not really live up to it mark. The amenities are very few and those available do not live up to the standards. The state hockey association is based in Cuttack and officials only make infrequent trips to the region, much to the disgust of the locals in the region. The locals believe that people will continue to play the game, but what they question is for how long in the midst of very little support from the state administration. If the apathy continues, the game will die a slow and painful death. Tucked away some 15 km from the bustling western Odisha town of Sambalpur a dream has taken shape in the form of the Sambalpur Football Academy (SFA). And the vision has begun to make an impact in the life of youth in the State. The Academy, established on a sprawling 18-acre property very close to the Hirakud Dam , is complete with three full-sized playfields, a state-of-the-art gymnasium, accommodation for nearly 100 boys of different age groups, a dining hall, a well-equipped kitchen, class rooms, a three-storied guest house, swimming pool and a well-stocked store room. Apart from learning the nuances of the game, the boys are given compulsory education in a Government-affiliated school. Having come into existence on November 22, 2008, the SFA has made a marked difference to soccer in the State. Two of the leading clubs of Cuttack have based their teams on the SFA boys. More are eyeing talent from this academy. The SFA, an initiative of former minister, player and a soccer lover Jaynarayan Mishra, is run on self-finance and donations. The MLA of the area for the third successive term, Mishra’s project is contributing to the development of tribal welfare. As much as 90 per cent of the boys are tribals of the State. The rest of the trainees are from Jharkhand, West Bengal, Assam and even Manipur. The teaching staff is all from the region which helps the boys and the faculty to interact better. Apart from well-qualified coaches, headed by technical director Sanmoy Basu, the academy has a doctor, a dietician and administrative staff to run the programme smoothly. “We spend close to Rs 1.5 crore per year on the project. The biggest problem we face is lack of exposure to our boys against better teams. We are planning to send our boys to Kolkata to play in local league,” Mishra says. After organising a football festival for schools in the area, the academy coaches fan out to other States to choose boys for the academy. At present, there are 25 boys in the under-14 group, 24 in U-16, 20 in U-19 and 20 more senior boys. Pritam Singh is presently in the National under-17 camp in Goa. Sayed Viju Oasim, Golak Pradhan and Prakash Naik were part of the group of Indian boys trained at Arsenal and A.C. Milan academies. The best boys play for Samaleswari FC, owned by the academy. The SFA is indeed the beginning of a silent soccer revolution. Balangir, Aug. 21: For Roshanara Parveen, this Id has been special. When news of her selection for the Indian team for the forthcoming Twenty20 Women’s World Cup in Sri Lanka came in, the 20-year-old girl said she was “surprised but extremely happy”. “It is every cricketer’s dream to play for the country some day. I have been working very hard to earn a place in the national side. I am grateful to the selectors for reposing faith in my abilities and I will do my best to live up to their expectations,” said Roshanara, visibly excited as she spoke about her feat. A right arm off-spinner, Roshanara is the second woman cricketer from the state after Madhuri Mehta — also from Balangir — to represent India. The local girl will be seen in action in the T-20 World Cup that starts from September 26. Her proud parents, Kaifatullah Khan and Hosnara Begum, said their daughter had always taken great interest in sports, ever since she was an active little schoolgirl. She even wanted to enrol in a sports hostel, but her father did not agree. Her chance came when an enthusiastic group of cricket lovers in the town formed a women’s cricket team in 2007. “Roshanara jumped at the prospect of playing with them and we told her that we would support her in every possible manner. Her hard work and dedication has finally paid off. She has made us very proud and the fact that we got the news of her selection on Eid proves that Allah is looking out for her,” said Khan. With just a month to go for the big-ticket tournament now, she has started preparations to prove her mettle. “I will work on bringing some variation into my bowling. I won’t stick to just orthodox spin. Sri Lankan grounds are known to be spinner-friendly and I will try to use this to my advantage,” said the vivacious girl, who idolises Kiwi spinner and cricket poster boy Daniel Vettori. Bhubaneswar, Feb. 4: Odisha girl Madhuri Mehta has been included in the national senior women’s cricket team for its upcoming tour of West Indies. Madhuri, who is from Balangir, caught the selectors’ attention by scoring 36 and 40 against Uttar Pradesh and Karnataka, respectively, in T20 matches held in Cuttack last month. The Odisha Cricket Association (OCA) today announced a cash award of Rs 1 lakh for Madhuri. The Indian team will play five T20 and three One-Day Internationals in the West Indies. Anjum Chopra will lead the team in the series. Anjum Chopra replaced Jhulan Goswami as the skipper of the Indian women’s cricket team ahead of its West Indies tour. Goswami will continue to spearhead the attack. India will play five Twenty20 matches and three ODIs in the tour that will commence from February 18. Anjum Chopra (captain), Mithali Raj (vice-captain), Jhulan Goswami, Harmanpreet Kaur, Veda Krishnamurthy, Subhalaxmi Sharma, Diana David, Sunitha Anand, Gouhar Sultana, Mamtha Kanojia, Archana Das, Ekta Bist, Amita Sharma, Madhuri Mehta and Sulakshna Naik.